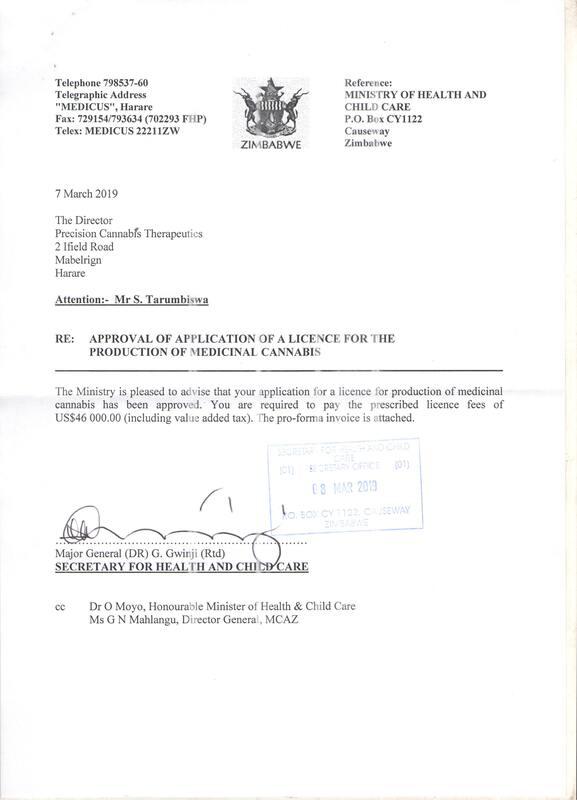 Precision Cannabis Therapeutics is the first Zimbabwe business to obtain a license to manufacture medical cannabis commercially since the country legalized medical cannabis for medicinal and research purposes in April 2018. “The government of Zimbabwe is open for business and welcomes investors in all sectors of the economy, including licensing for the production of medical cannabis,” said Nathan Emery, COO of Precision Cannabis Therapeutics Zimbabwe. The company will be beginning cultivation after paying a $46,000 fee. According to the Candid Chronicle, the Zimbabwe government has received around 200 applications from domestic and foreign businesses, but only 37 investors have made it to the next round and are likely to get their licenses approved soon. “Let’s give investors a chance. There is a lot of excitement which will bring a lot of investment and help people produce oils for cancer and other medicinal purposes,” said Vangelis Haritatos, the Deputy Minister of Lands, Agriculture, Water, Climate, and Rural Resettlement. Zimbabwe postponed its medical cannabis program in order resolve some of the regulation issues pertaining to the plant just a month after cannabis was legalized in the county. Nonetheless legalization kicked off the country’s cannabis export industry. A company in Lesotho exported the first batch of medical cannabis to Canada last year. Multinational companies have had their eyes on the budding African cannabis market’s turnover since then and have invested heavily in the sector. The amended Zimbabwe cannabis law will allow businesses to ship their products to certified domestic patients as well as export their products to other countries via the Robert Gabriel Mugabe International Airport in Harare as the only port of entry and exit. The regulated cannabis products allowed for medical and scientific use include dried and fresh cannabis, oils, cannabis plants and seeds. Licenses will need renewal after twelve months and the renewal process would cost $50,000. The law does not permit any form of cannabis advertisement.